Gallipoli lies on a narrow peninsula, 126 miles west-southwest of Istanbul, where the Dardanelles open into the Sea of Marmara. Gallipoli fell into the Ottomans in 1356, after the establishment of a bridgehead on the peninsula (in Tzympe). This was a very important victory for the Ottomans because this was a significant naval base in the Aegean and of strategic importance for the defence of Constantinople. 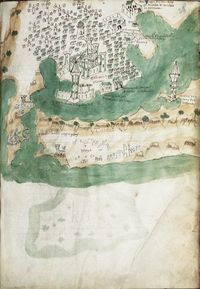 The Ottomans used Gallipoli to launch raids northward into Thrace and to expand the area of Ottoman occupation .However they lost Gallipoli in 1366, but in 1376 the Byzantine emperor ceded it to the sultan by way of tribute (Chambers 1970, 46; http://history-world.org/Turks%20In%20Europe.htm).